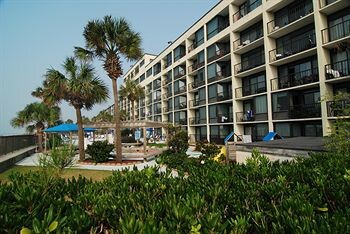 Property Location In the heart of North Myrtle Beach, Peppertree Ocean Club A Festiva Resort is close to Surf Golf and Beach Club and Cherry Grove Pier. This beach condo is within close proximity of Molten Mountain and Mayday Golf.Rooms Make yourself at home in one of the 122 air-conditioned rooms featuring kitchens with full-sized refrigerators/freezers and stovetops. Rooms have private balconies. Cable programming and DVD players are provided for your entertainment, while complimentary wireless Internet access keeps you connected. Conveniences include separate sitting areas and microwaves, as well as phones with free local calls.Rec, Spa, Premium Amenities Take advantage of recreational opportunities offered, including an outdoor pool, an indoor pool, and a spa tub. This condo also features complimentary wireless Internet access, supervised childcare/activities, and gift shops/newsstands.Business, Other Amenities Featured amenities include a business center, a computer station, and laundry facilities. Free self parking is available onsite.